I’ve often contemplated the affect of technology on our generation…and on myself personally. It seems that we are obsessed with entertainment, in a variety of forms. There are so many things that can occupy our minds, so that we never have a moment of peace & quiet. Do we understand & stop to consider the toll that this is taking on ourselves, our families, & our communities? 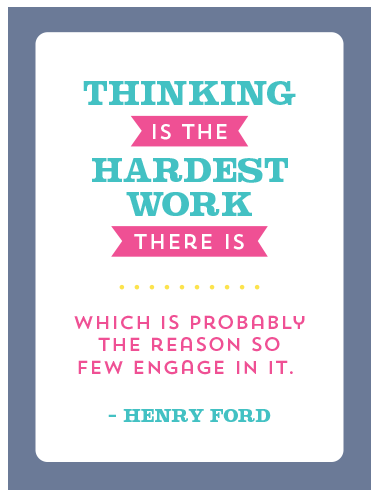 I love today’s quote by Henry Ford because it reminds me that “thinking” (concentrating, focusing, considering, pondering, meditating, contemplating, etc.) doesn’t just happen by default…it really does take work! And it means removing some of the distractions that are so loudly calling for our attention. Are we, as Neil Postman suggests, amusing ourselves to death? Are we willing to give up our freedoms, & the best things in life, in exchange for the allure of continual entertainment? Now, I’m not here to preach specific do’s & don’ts of how you should spend your time…that’s not the point…and that is up to each person to decide for themselves. – Do you create time each day to remove yourself from the noise & distractions of the world so that you can focus on what’s most important? – Do you work through difficult things in your mind by contemplating & pondering them…or do you often escape dealing with life through different channels of entertainment? – Do you know how to meditate/ponder for a set amount of time? Or do you find your mind wanders easily? – Do you question your thoughts…or allow them to run on default mode most of the time? Love this. The past year with particular things happening in our family and with myself I have created a bad habit of escaping through entertainment with things are stressful or when I just cant cope with something. I need to break that habit! I have wasted precious time just because I feel like at the moment I cannot handle and need to escape. In the end I don’t feel any better. This post has inspired me to do better. To pay more attention to my thoughts and think through them…not escape them. Here is a pdf of quotes on pondering that I have used before. Very enlightening. I forgot about it until this post. “You need time to meditate and ponder, to think, to wonder at the great plan of happiness that the Lord has outlined for His children. You need to read the scriptures. You need to read good literature. You need to partake of the great culture which is available to all of us.